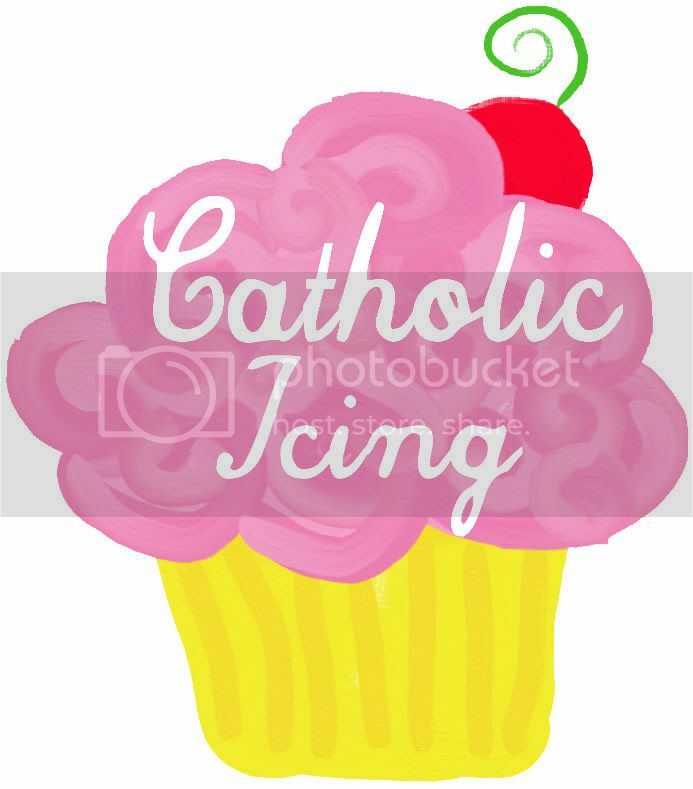 I'm very excited about the Catholic craft I have to share with you guys today! 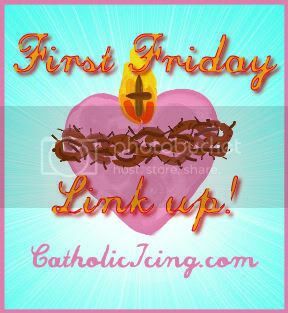 The 3 biggies during lent are prayer, fasting, and almsgiving. This Lenten activity will help you teach kids about almsgiving, and also count down the days of lent. 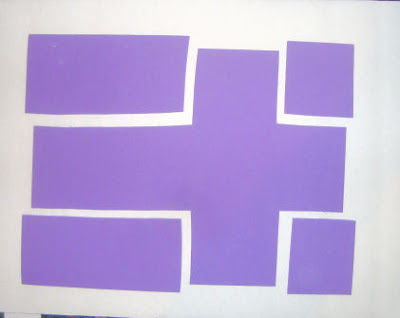 Start by taking a large, rectangular piece of fun foam (available at a craft store for about .60) and cutting out the corners to make a cross shape. 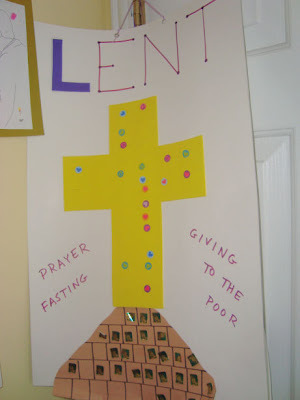 We used purple since that's the liturgical color of lent. Next, you'll need to make 40 slits in it to hold the pennies. You want the slits to be about as wide across as a penny, but it doesn't have to be exact. In fact, I was really surprised with just how forgiving the foam was- it really does a good job of holding those pennies. 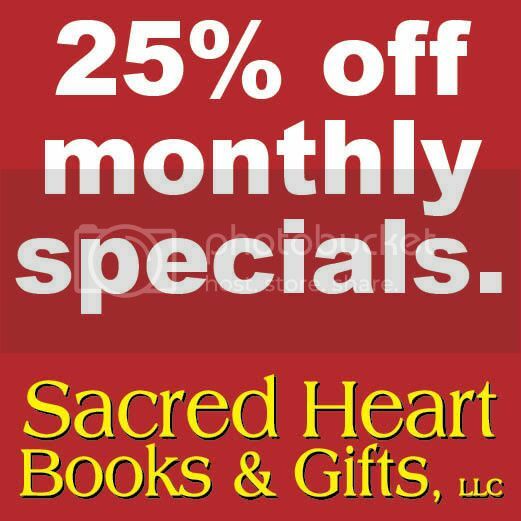 *Use caution with a box cutter! 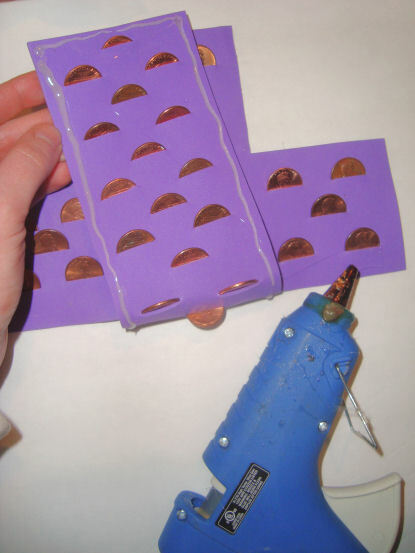 Insert all the pennies before gluing it down. 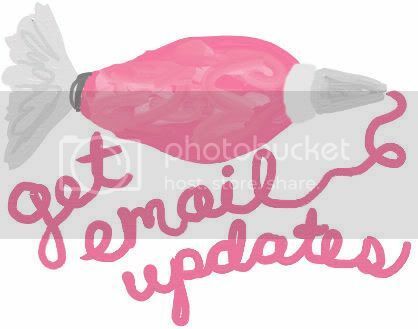 Trust me- this will make it much easier! 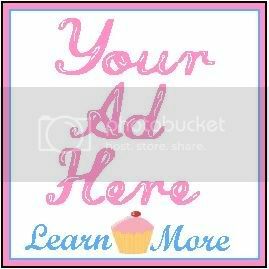 Lay your cross where you want it on your poster board or foam board. 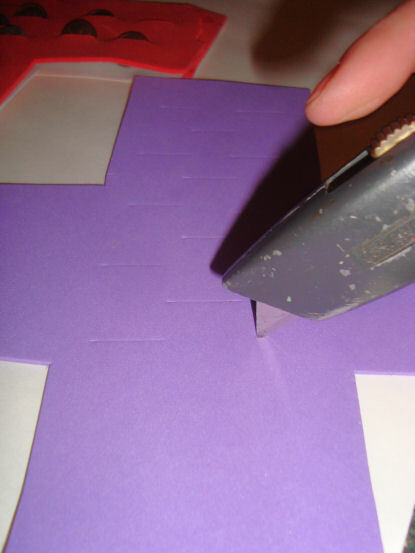 Peel back just one section of the cross at a time and go around the edges with hot glue, then firmly stick it onto your paper. *Use caution with your glue gun! When the edges are all glued down, cut out a mound of dirt from fun foam and glue it to the bottom. Then write "Give Alms" with glitter glue or a marker. At this point you can let your kids decorate it with markers, sticker, etc if you want. I opted not to because I want to use these same boards year after year. 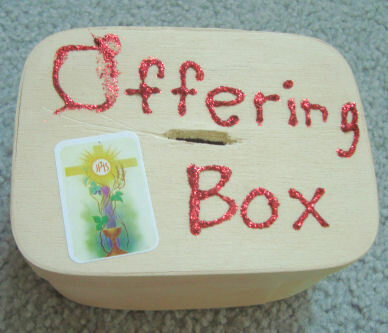 For each day of lent, have your say a prayer and remove one penny from the cross and put it in their offering box. (I posted about how to make and offering box with your child here). 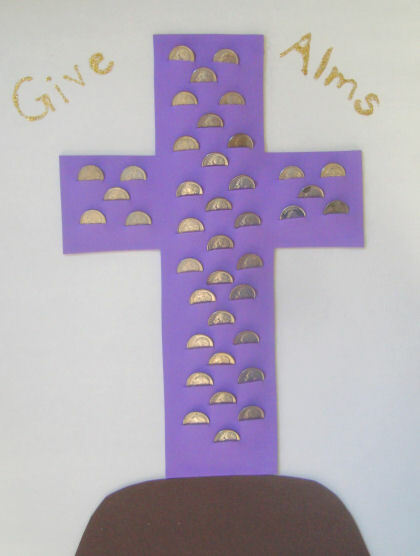 Do not remove any pennies on Sundays- they don't "count" in the 40 days of lent! My preschool co-op did this craft last year and theirs came with stickers. 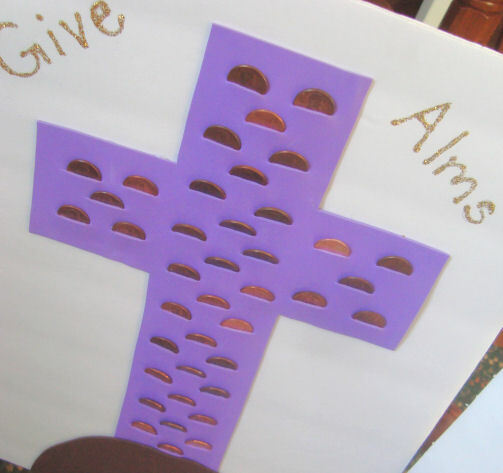 Every Sunday during lent, they put a sticker on the mound of dirt at the bottom of the cross. 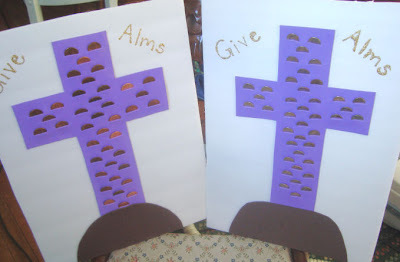 Again, I don't want to do that because I plan on pulling these out and reusing them every lent. I love how bright and shiny the dimes are in comparison to the pennies, and I think this will be a great surprise for my kids on Easter morning! This was surprisingly easier to make than I originally thought it would be. 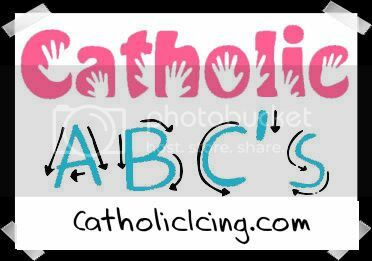 Wish I could take credit for this idea, but it was thought up by my friend, Denise, who used to teach my preschool class before me. She is awesome! Here's a picture of one she made. 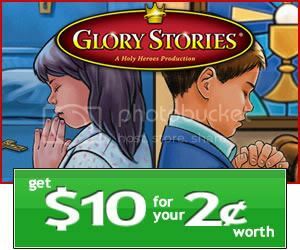 They had a chart at the bottom (also with 40 squares) and every day they got a sticker for saying a prayer, and then put a penny in their offering box. I love how the one below has a string at the top for a door knob. This is great! Did you just use a 8.5 x 11" fun foam sheet? This is a really great idea for incorporating the idea of giving to the poor during Lent! Thanks, Lacy! We did this for our kids and so far, we're really enjoying it. 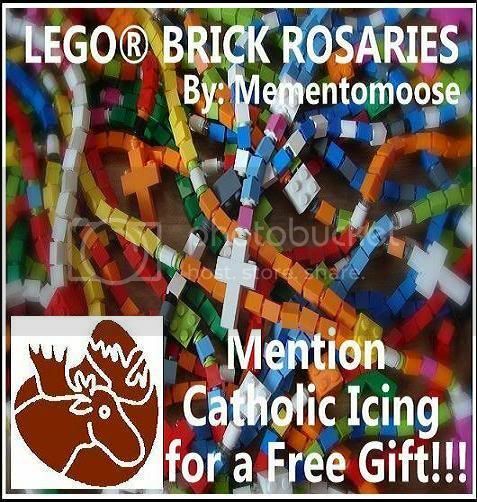 It is a great hands on way to show kids how to give. Thanks for all the great ideas.